Miami Beach can have its cake and eat it too: if voters OK a convention hotel on city land on Nov. 6, they’ll fuel the economy with higher-revenue events, pour in lease and tax income from the hotel to add city infrastructure, and also reduce convention center traffic. Traffic once again is the scarecrow to frighten away votes for a hotel. As in the past, a costly drive by undisclosed foes aims to deter a hotel linked to the convention center by claiming a hotel would jam streets with cars – as though hotels on private land in the city have no auto traffic. Yet as Mayor Dan Gelber noted last week in a temperate explanation, a convention hotel will help the newly renovated Miami Beach Convention Center transition from a 70% diet of trade shows that depend on visitors driving over and back for part of a day to a far larger percentage of conventions where attendees fly in and go days on end without leaving. That’s fewer people, fewer cars, and more spending in Miami Beach restaurants and stores. Miami Beach will never lure mass conventions that fuel other cities: the convention center isn’t among the nation’s 25 largest. The city just invested $640 million in upgrades that let the center compete not for 100,000-guest bookings but for smaller events with far larger local spending per person – assuming it has a convention hotel attached. Without that hotel, the newly reopened center can still be fully booked, but with mostly offerings that attract nearby drivers to Miami Beach. 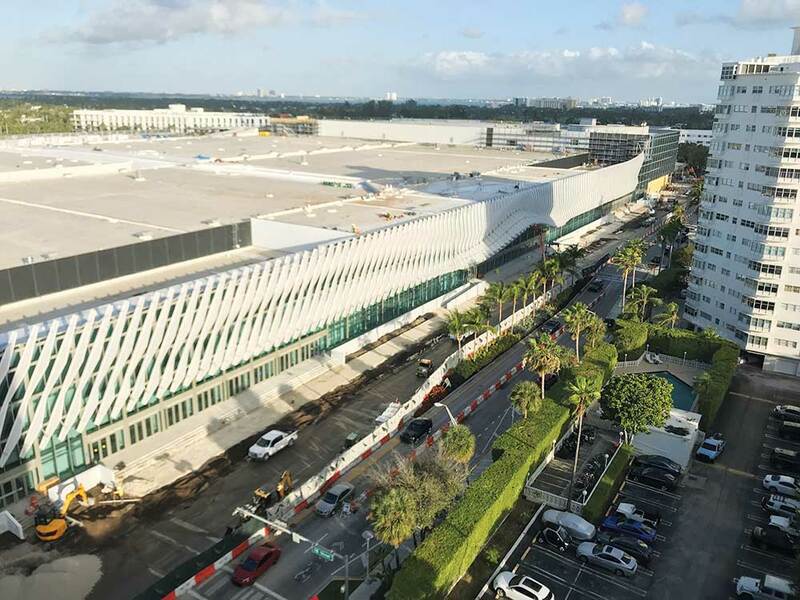 Success of Miami Beach Convention Center makeover depends on a connected hotel. Today, the Greater Miami Convention & Visitors Bureau, which lures meetings and conventions to Miami-Dade, has one arm tied behind its back in booking. It has an upgraded convention center, but quality bookings depend on a center hotel that reserves most rooms for event guests and charges rates competitive with hotels at similar-size convention centers. Miami Beach will always have an edge with sun, sand, surf and the allure of a famed visitor-welcoming community. But meetings and conventions are price sensitive, and a convention center and its attached hotel will only survive if Miami Beach pricing competes. The meetings industry around the nation is watching this vote carefully. Voters can help us compete for professional organizations’ meetings by allowing the city to lease its land beside the convention center for 99 years to Miami Beach Connect, a partnership formed for the deal by Miami-Dade developers Jackie Soffer and David Martin. They were the sole bidders, understandable since voters have several times rejected a lease to a convention hotel in a vote that requires 60% to pass. They’re offering the city the greater of a total $16.6 million rent over the first 10 years or a slice of revenue. The hotel’s property taxes are estimated at $96 million for 30 years. The developers would build and privately fund at $348 million to $362 million an 800-room hotel, 185 feet tall, on 2.6 acres behind the Fillmore, linked via skywalk to the convention center. The hotel would rise on a 53-foot pedestal for parking, a ballroom and meeting space. Could the city have gotten more? Unfortunately, after voters beat down past hotel deals, there was only one bid. If voters want a convention hotel – and they desperately need it – it’s the best offer simply because it’s the only one. Voters who opted out of past convention hotel deals made bidders gun shy. The developers no doubt will profit nicely on city land. But voters should welcome that – a healthy business is a win for the city and taxpayers as well as the developers. Everyone should prosper. Thoughtful voters who care about quality of life will find the hotel proposal a plus. It’s 103 feet shorter than the one they rejected in 2016 (which helps make the developers’ planned expense at least $234 million less), and it guarantees no gambling. Voters are even asked to choose on the ballot how the city will spend city funds the hotel generates – an extraordinary step. Moreover, as City Manager Jimmy Morales points out, a convention hotel won’t compete with others nearby. It would help lure top-quality meetings to spill over to other hotels while filling restaurants throughout the area. Complaints that meetings and conventions bring more people to Miami Beach are perfectly right: Miami Beach lives and dies by visitors, and will continue to. They fund the services to support residents and provide customers for the city’s businesses. It’s similar to Seattle, where some people complain that 45,000 high-paying workers at Amazon’s headquarters crowd roadways. But Amazon also means better-paid residents and all the amenities that come with a city that’s doing well. As he also points out, the convention center will be fully booked regardless. But with an attached hotel, it can be booked so that that more money is spent in the city with less – not more – traffic. But if the city makes its case clearly, as Mayor Gelber did last week, there should be no doubt in voters’ minds of the economic and lifestyle benefits to all of finishing the job of a convention center upgrade by providing a proper convention hotel to match.